or copy this trackback: http://engineering.electrical-equipment.org/electrical-distribution/residual-current-circuit-breaker-rccb.html/trackback from your own site. Thank you. It is cleared explain. Mr.Bipinkumar , I would like to share my experience in RCCB tripping problem. Please ensure the type of loads connected to the distribution board. Please be aware that any type of HARMONIC LOADS CONNECTED TO the distribution system will result in spurious tripping of RCCB. HARMONIC TYPE OF LOADS IN A SYSTEM ARE SOMETHING LIKE COMPUTORS , MONITORS etc which uses rectifiers and switch mode power supplies. In a HARMONIC TYPE OF LOADS , EVEN IF YOUR LOADS ARE BALANCED YOU WILL COME ACROSS HUGE NEUTRAL CURRENT (TRIPPLEN HARMONICS) . THERE ARE SEPERATE RCCBs MEANT FOR SUCH LOADS. Mr. RASHID IT IS VERY SIMPLE.WHEN YOUR NEUTRAL WIRE IN THE OUTPUT OF THE RCCB IS TOUCHES (OR) COMES IN CONTACT WITH EARTH , REMEMBER YOU ARE CREATING A PARALLEL PATH TO THE RETURN CURRENT ( IT IS SOMETHING LIKE A LEAKAGE CURRENT THROUGH EARTH) SUPPOSED TO BE THROUGH NEUTRAL. NATURALLY THE SENSOR SEES THE DIFFERENCE IN SUPPLY CURRENT(THROUGH PHASE ) AND RETURN CURRENT (THROUGH NEUTRAL) AND HENCE IT TRIPS THE RCCB. There is a CORE BALANCED CURRENT TRANSFORMER (otherwise called CBCT) in the RCCB. The phase wire from the input passes through the CBCT and connected to output of the RCCB. The neutral wire from the input side passes through the CBCT and connected to the output terminal of RCCB. There is another secondary winding in the CBCT connected to an electronic circuit and activates a link to the trip bar of RCCB . When the phase current and neutral current in the RCCB is same , the CBCT is balanced. When there is a diff in the phase and neutral current (Defined by the rating of RCCB) there is a current in the secondary winding of CBCT. For welding activity leakage current will be more than 30mA and above that value of current will be harmfull to human. so which RCCb should be prefered a30mA or 100mA and why? we have a 3 phase connection in our recently purchased house in Belgium. There is a 4 P/40A/300mA RCCB that is, I assume, put in the incoming electricity phases (3P for the 3 phases and the 4 Pole connected to the Neutral) and a 4P/40A/30mA RCCB that is, I assume, 3 poles in the 3 phases and 1 pole in the Neutral that goes into the circuits for the internal wiring. The electricity attestation that was done on the house prior to our purchase, indicates that there is need for an additional 30mA RCCB, and we do not understand why, please can someone explain the need for this. The trippig value set at 100ma means when 100ma or more current is flow in nutral / earthing it may be trip. You aware that fatal current is 5 mA to 10 mA. It is advisable to set 30 mA when in your home or industry you use 24 hours duty i.e continuous duty. For higher capacity it i.e 100mA or more is apply where more current rated single apparatus is use. It is advisable to fit rccb with refrigerator, single phase water sump motor or pump and heater use in your house. In those house where small kids advisable to fit rccb. at a home having one submersible motor , one fridge, at a kitchen mixture grinder. how many rccbs used? My question is, can 3 phase RCCB works on single phase circuit? Hi. Our house is old and we dont have ground wire. Will the RCCB be able to save me if I touch one electrical case (Like Microwave 2600W) without ground wire from High Shocks? 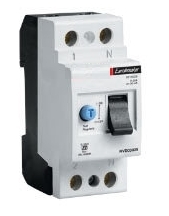 1.Single-pole / SP / one-pole – the RCD will disconnect the energized wire only. 2.Double-pole / DP / two-pole – the RCD will disconnect both the energized and return wires. I have RCCB in my home by standard company. i installed it in the year of 2009.from last few days it is tripping sometimes in a day. i filled this tripping is due to newly installed Inverter AC in bed room. Can you please guide me the reasons for tripping. 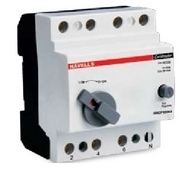 The Mains supply is three phase supply. What will happen if the three phase wires are connected in a single pole and the neutral on the other pole of a 2 pole RCCB? Will it work fine? hi. in my home RCCB is tripping as soon as electricity board power resumes. if we switch on after sometime it works normally. what can be the root cause for this. I have changed the RCCB with new one and checked but still the problem persists. sir, I connect 3ph-N ( 4 wires) to 4 pole RCCB incomer. my load is 3phase motor ( without neutral), my question is will RCCB trip when any of motor phase gets earthed? please show line diagram of Rccb. How to connect rccb? how to protect rccb? Hi, the whole thing is going nicely here and ofcourde every one iis sharing facts, that’s actually fine, keep up writing. Hi, in some RCCB ( up 40A) I see a capacity, what is this? and it’s function?